38 1/2 X 48 1/2"
This work is part of the exhibition at Inpost Art Space, Albuquerque, New Mexico 2019 (price includes Frame). 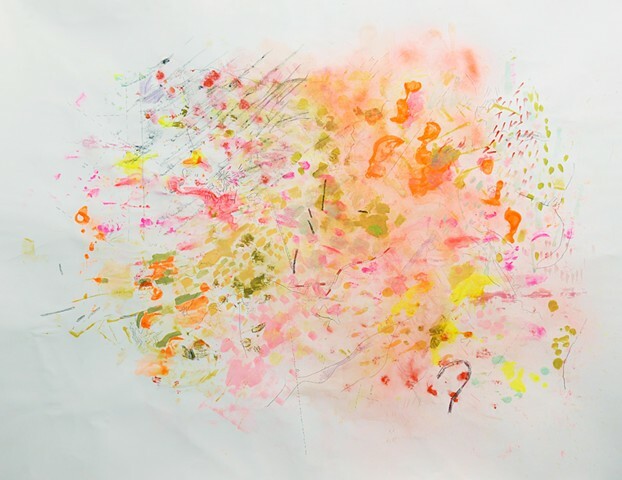 The Inpost Artspace is pleased to announce Adjacent Possible, a selection of monotypes created while in residence at Vermont Studio Center in Johnson, Vermont by Isadora Stowe. Additionally, each monotype is layered with spray-paint, stencils, collage and abstracted topographical map drawings. The maps are connected and separated areas of the southwest borders of New Mexico, Texas and Mexico. Stowe’s work explores identity and space construction, real or imagined. She is interested in the ideas of place and cultural constructions and states, “maps are established to show us where we are, but when made ambiguous, a sense of direction can be lost and questions about our own constructions of where and who we are surface”. The title of the show, Adjacent Possible, references Steven Johnson's description in which he illuminates the adjacent possible as “the kind of future, hovering on the edges of the present state of things, mapped in which the present can reinvent itself…”.